Because local businesses are a vital part of communities, a pilot Age-Friendly Business District (AFBD) was created as part of the Miami-Dade Age-Friendly Initiative. Business Districts can help businesses grow in their respective markets, become more aware of older patrons, educate stores on how to be age-friendly, or how to retain older employees. The first Age-Friendly Business District in Little Havana, Miami was created to encourage older adults to walk to resources and increase physical activity by providing incentives to the older adults in order to do so. For your convenience, we have created this Toolkit containing practical tools and resources so that you can implement similar strategies within your own community. 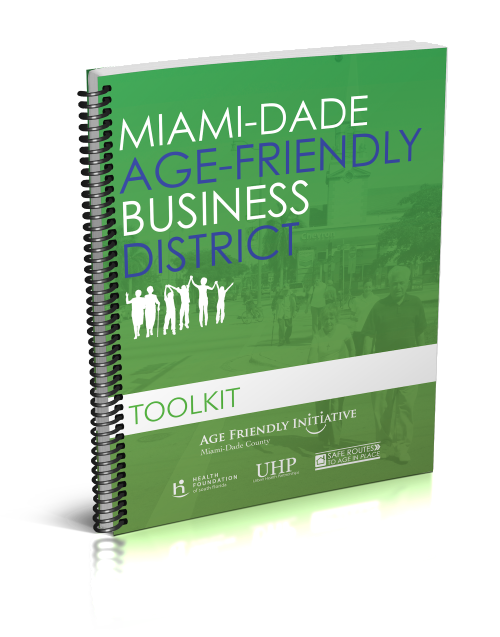 It is designed to provide a general understanding of the importance of age-friendly businesses, an overview of what was done in our pilot program in Little Havana, and a guide through the process of creating an age-friendly business district at the local level. We encourage you to read through this toolkit and identify strategies that you would like to implement in your own neighborhood together with businesses, key stakeholders, and older adults in your community. Age-friendly businesses are just one piece of the puzzle as we work toward making all of Miami-Dade County more livable for people of all ages, especially older adults. Our partners include the following lead agencies: AARP Florida, Alliance for Aging, Florida Department of Health in Miami-Dade County, Health Foundation of South Florida, Miami-Dade County, Miami-Dade Transportation Planning Organization, United Way of Miami-Dade, and Urban Health Partnerships. Copyright © Miami-Dade Age-Friendly Initiative.